"We want to fit a mussel with a little backpack and set them free," Anton Kruger, professor of electrical engineering. 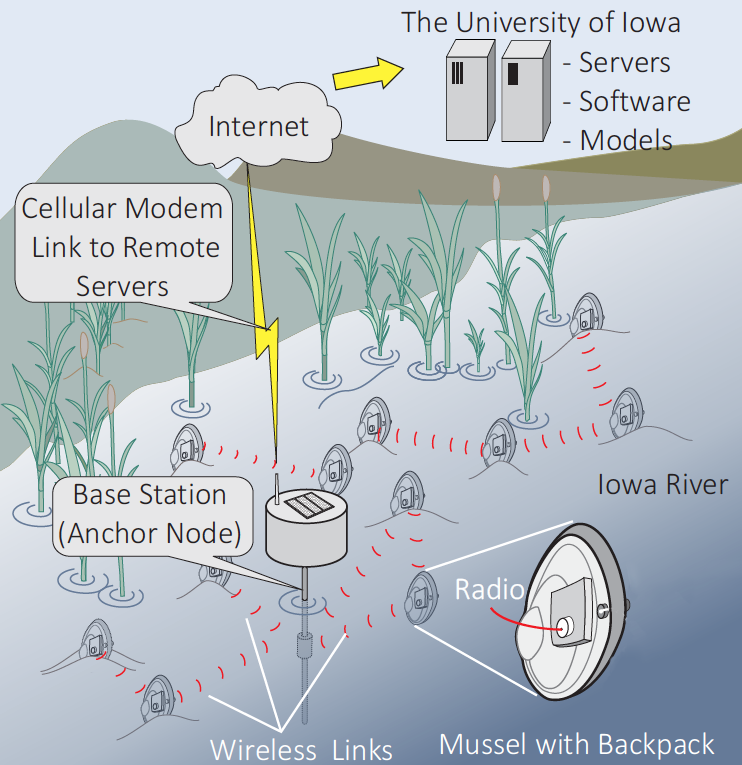 University of Iowa researchers are studying how to enlist the help of large numbers of freshwater mussels, which they would outfit with electronic monitors, to learn more about the nitrogen cycle in river water. Their ultimate goal is to reduce harmful nitrates in Midwestern waterways. Iowa and other states unintentionally export excess nitrates from fertilizers to the Gulf of Mexico via local rivers and streams that are part of the Mississippi River watershed. Nitrates settle in the Gulf, leading to algal blooms as large as 6,000 to 7,000 square miles that deplete oxygen in the water and cause “dead zones” that are devastating to Gulf fisheries. Researchers hope cybermussels will provide data valuable for developing strategies to minimize Iowa’s contribution to problems in the Gulf. The electronic backpack being developed by UI engineers will communicate measurements of a mussel’s gape—the rhythmic opening and closing of the mussel’s valve—in real time. This will give researchers immediate feedback if the mussels’ regular cycles are disrupted, indicating a change in their environment. The pocketbook mussels used in this study live for more than 50 years and likely would outlive the battery life of the devices, which is about one year. This single year of data, researchers say, would provide valuable insight into the lives of the mollusks and the environmental issues that affect rivers. The UI’s project is a collaboration between Just; Anton Kruger, professor of electrical engineering; and Ruben Llamas, who recently received a Ph.D. in electrical engineering from the UI.